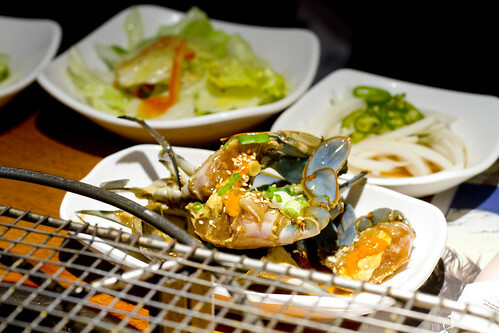 As soon as you sit, every inch of the table is covered in panchan (small side plates) and condiments. 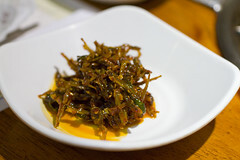 They were all good but the most memorable were marinated spinach, garlicky bok choy, and great kimchi. 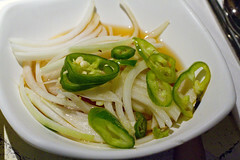 For me, kimchi can make or break a meal. 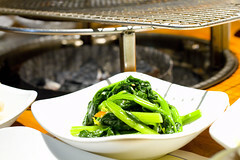 I like to eat it with most bites of the barbecue meat and in between everything else, so it can add a freshness and happy kick to the whole meal, or drag a meal into a musty low. 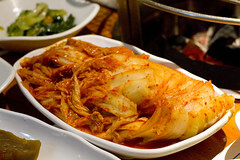 Here they offer a richly flavored kimchi and a lighter and sweeter un-fermented kimchi. Both are great! 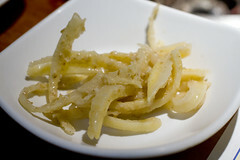 The raw cured crab (also a panchan offering) is so interesting, with a similar texture to cured salmon/lox. 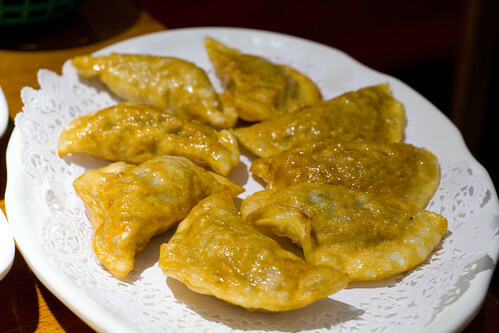 It becomes soft, slightly sticky, and gelatinous, totally unlike flaky cooked crab meat. 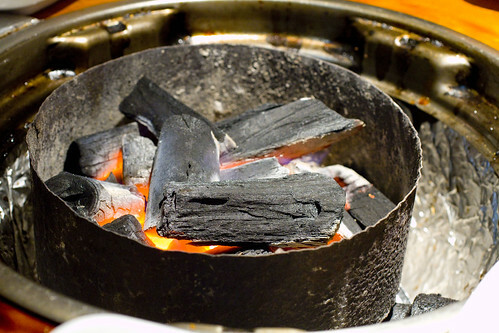 One major difference you’ll notice immediately is that they cook the meat over a wood burning grill embedded in your table. 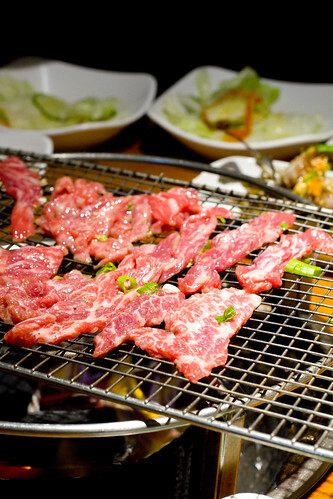 Next, you’ll see the most beautifully marbled kalbi (beef short rib), making it extra tender. Everyone eats it a little differently but my favorite is rolling the red rice, kalbi, and kimchi into lettuce. You can’t help but keep going and going. Good thing we had two orders. 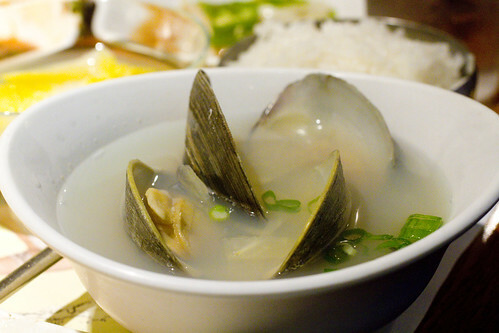 The Clam soup is so purely clam, a refreshing simplicity in a mostly strongly flavored meal. 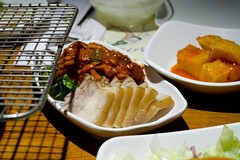 Despite not needing any more food, Scott and Angie wanted us to try the pork belly with kimchi. 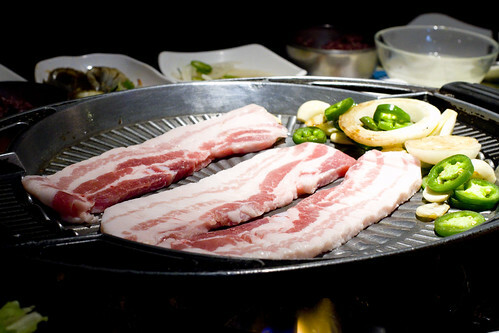 They changed the set-up to a different grill pan and start the pork belly first. 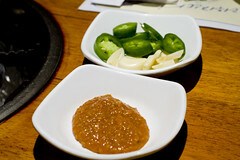 After the pork fat starts melting, they cut up the pork and add the un-fermented kimchi. 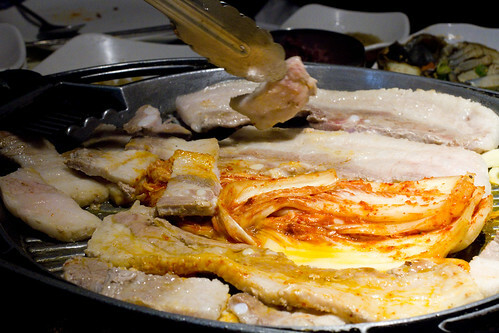 The pork gets crisped brown spots while the flavorful fat seeps into the kimchi. 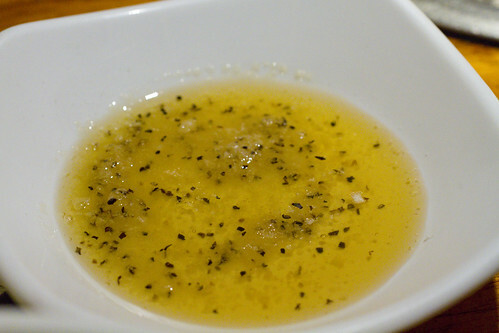 Little dishes of sesame oil with salt and pepper are given to dip the pork into. As we slowed down, we all realized how full we were, but couldn’t resist trying to stuff a few more bites in. It was so delicious and deeply satisfying. Meals here will be about $25 per person, stuffed beyond normal gorging, and well worth a trip out of the city. Who’s coming with me next time? posted by jessica	at 12:07 AM	Filed under Asian, Favorites, Restaurants. You can follow any responses to this entry through the RSS 2.0 feed. Both comments and pings are currently closed. Everything you showed here looked so good. The Korean community is growing quite fast where I live. 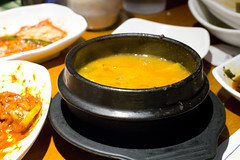 Hopefully, good Korean restaurants are coming around too. That looks pretty good. I’m on it! Me me me! 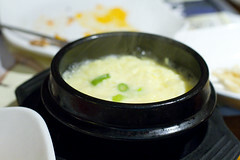 I am totally up for a trip to get some good Korean food. 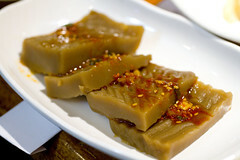 I must never have had the really good stuff because I’ve only ever eaten it in Korea-Town! After reading this. I really need to change that! Let’s plan a trip for late March? Your photos are so tempting! There are so many advantages to living in NYC….eating is one of them! Steve, we’ll prob need to eat out more while the new kitchen is being built so let’s make some dinner plans!